When it comes to caring for a senior loved one, there are so many different challenges that can come your way as your loved one continues to age. Many familial caregivers, loved ones and adult children actually aren’t aware of some of the different changes that seniors tend to go through during this time. One of these changes that many senior caregivers are unprepared for are change in your loved one’s appetite. A loss of appetite may seem to develop slowly. Perhaps they no longer finish their plate at dinner, or they’ve stopped snacking at family gatherings. Maybe you’ve noticed your loved one’s pantry is empty and suspect they aren’t eating when they are alone. If you suspect that they are losing their appetite, chances are you are correct. However, this doesn’t necessarily mean there is a medical emergency brewing. Changes in appetite are actually quite common among seniors and tend to only continue as they age. However, your loved one still needs to eat and still needs to get plenty of vitamins and nutrients in their diet. If you are worried about your loved one’s health make sure that you take them to their primary healthcare provider first for attention, then consider these tips to ensure they are getting what they need, even with their dwindling appetite. Make sure that your loved one is drinking plenty of water. Chances are, if your loved one is no longer eating, they may be slightly dehydrated, so the more water they can drink, the better. Add lots of fruits and veggies into your loved one’s diet. If your loved one isn’t eating as much as they normally do, then you need to make sure that the things that they are eating are healthy, which means plenty of fruit and vegetables. Encourage your loved one to get more sleep. When seniors aren’t sleeping as much as they should, it can have a major impact on their bodies and their appetites. Whether they aren’t sleeping because of pain, a lack of schedule or stress, the more you can do to help get your loved one sleeping every night, the better their appetite will be. Make eating a social event. Many times, seniors lose their appetites then don’t eat all together because they forget or don’t feel like it. Making eating a more social event will encourage seniors to eat, even when they may have not normally thought about it. Family dinners and meeting your loved one for lunch can really go a long way. Just because your senior loved one is starting to lose their appetite, it doesn’t mean that you can’t continue to take steps in order to keep them as healthy as possible as they age. Keep these tips in mind if you are concerned about their diet so you can make sure you loved one is staying healthy, even if their appetite is starting to change. This can be a nightmare for family caregivers. Losing your appetite at an older age can take a toll on your health. Most of the seniors neglect nutritious food and stay dehydrated for the whole day. These are amazing tips. Thanks for sharing. Thanks for sharing the blog. This problem is becoming more common nowadays. 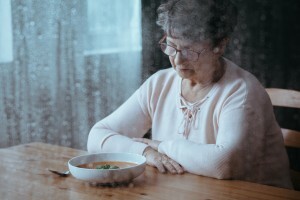 Seniors are eating less than required because of depression or an age-related disease. Families should look after the daily diet of seniors.